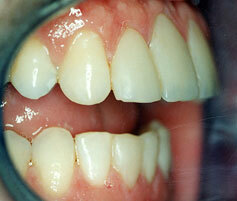 Discoloured teeth can be made white and you can smile without being self-conscious with cosmetic dentistry. Renee was unhappy with the space in her front teeth and the colour of her teeth. We were able to improve her smile with a gum lift and cosmetic bonding. Renee was over the moon with the result. 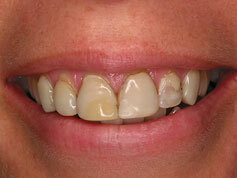 This patient had discoloured teeth and old stained bonding. It was her life dream to straighten the bottom teeth. 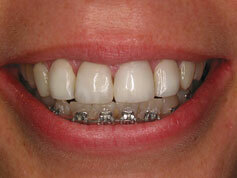 We straightened her bottom teeth with braces and placed cosmetic bonding on the front teeth. The patient thanked us for her movie star smile. This patient would grind her teeth at night and had worn down the teeth. The teeth were also discoloured. We whitened her teeth using Brite Smile and then we used the laser to do a gum lift so we could lengthen her teeth and we then paced cosmetic bonding on her front teeth. Sue wears an orthotic at night to protect her new smile from grinding. Sue told us that she was always self conscious of her teeth and made an effort not to show them. Sue now enjoys showing off her new smile. Josie was getting married and she wanted a brighter, whiter smile for the wedding photos. Her front teeth had gone black after root canal treatment. We whitened her teeth and then placed crowns on her front teeth just in time for the wedding. Her wedding day was made even more special because she could smile with confidence. Josie thanked us so much for our great work and making her dream wedding come true. Julie had tetracyclen stains from taking antibiotics as a child. She was always very conscious of the staining and did not smile. 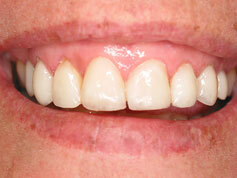 We were able to transform her smile with cosmetic bonding. When Julie looked in the mirror she could not believe they were her teeth. The result was amazing. Patient came from Sydney to see us because she had seen some of Dr Cassimatis’s work and she was recommended to us. 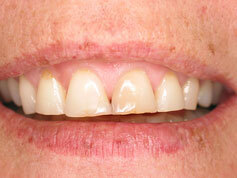 Her smile was transformed with cosmetic bonding.